Take in the views from a garden and make use of amenities such as complimentary wireless Internet access and wedding services. Additional features at this Victorian hotel include tour/ticket assistance and a picnic area. Enjoy recreation amenities such as a spa tub or take in the view from a garden. Additional features at this apartment include complimentary wireless Internet access and tour/ticket assistance. Barmouth is a seaside town in the Welsh county of Gwynedd, in north-west Wales. 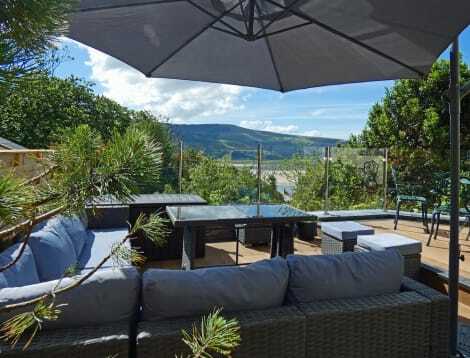 Situated at the mouth of the outstandingly beautiful Mawddach Estuary and conveniently located for Snowdonia National Park, Barmouth is a picturesque base from which to explore this fascinating region. Don't be fooled by its name. The area known as The Rock is in fact the old quarter of Barmouth. Its steep paths and winding alleyways are home to some delightful cottages and crumbling old terraces. Keep on climbing until you reach open country and Dinas Oleu (the Fort of Light), a viewing point from which you can see the whole town and its magnificent setting. Amble back down the hill and in to new Barmouth. Church Street has some lovely small shops selling souvenirs and bric-a-brac. After working up an appetite shopping, head to the Quayside and The Davy Jones Locker, which serves up good honest food for breakfast, lunch and dinner. If you're in Barmouth over the weekend, make sure you have a meal at Bistro Bermo. The award-winning restaurant pulls in regulars from miles around. It's only open Thursday until Sunday for dinner though, so ensure you book early to avoid disappointment. Church Street also has a number of great pubs in which to while away winter evenings. The Last Inn has friendly staff as well as good quality pub grub. Barmouth Park has an excellent kids' play area and plenty of space for exploration. There's a wooden pirate ship, a skate park and an AstroTurf pitch for endless fun. A pristine bowling green is on site for those who enjoy this leisurely past time, with first-timers always welcome. Back in the middle of town, take the kids to the Shipwreck Museum, a medieval building on the Quayside with plenty of interactive exhibits. The Round House houses a replica 19th-century prison where you can leave the youngsters while you head off back to the pub! On the beach there's all you would expect from a traditional seaside holiday. Munch on some bright pink candy floss and give the little ones their first donkey ride. There's also a funfair with dodgems and a carousel. Traversing the estuary is the 136-year-old Barmouth Bridge, a red brick viaduct that does much to augment the already stunning scenery. You can rent a bike or simply stroll on the wooden promenade that runs alongside the bridge. If you want to use it for its intended purpose, the Morfa Mawddach railway halt can be found at the other end. After experiencing all that the town has to offer from your Barmouth hotel, hop in a car or lace up your walking boots and explore the breathtaking beauty of Snowdonia National Park. The park covers over 800 square miles of stunning scenery and coastline. Go for a dip in Wales's largest natural lake, Llyn Tegid. Or if you're feeling really adventurous, climb the great Mount Snowdon itself. With so much charm and natural beauty, it's easy to see why people return to Barmouth year after year.